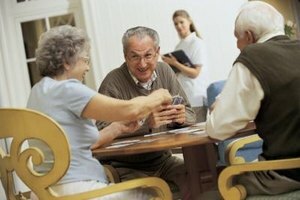 Games help senior citizens improve their memory. Dementia is always a threat to senior citizens. Losing short-term or long-term memory can have a debilitating effect on a senior's quality of life and put pressure on loved ones and family. Help a senior citizen in your care improve her memory with a variety of games designed to increase sharpness and awareness. Playing these games has the added benefit of being fun and encouraging bonding and community. This classic card game is a great way to exercise memory. Lay all the cards from a deck face down in a 13 x 4 pattern. The first player turns two cards over at random. If they are a match, he gets to keep them and go again. If they are different numbers, he must turn them back over and it is the next player's turn. As more and more cards are revealed, players are forced to remember where certain cards are in the grid. The player with the most pairs at the end of the game wins. Simon Says exercises reflex skills and memory. It is appropriate for seniors already experiencing memory loss. Stand at the front of the room. Do an action, such as putting your hands on your head. Describe the action, introducing it with "Simon says." For example, "Simon says put your hands on your head." The participants must imitate your actions until you describe a gesture you are doing without saying "Simon says." Anyone who does the gesture is out. The game requires that seniors quickly recall the names of body parts. This game is great for exercising and testing long-term memory. Assemble various recordings of songs that were popular when today's seniors were young. Play a short clip from a song. Participants must write down the name of the song and the artist. Play 10-15 different songs. Announce the answers one by one. The participant with the highest number of correct responses wins. This game strengthens both long- and short-term memory. Assemble a group of senior citizens in a circle. Go around the circle and have participants share memories of a favorite hobby or activity from their childhood. Once each person has had a chance to share, go around the circle again. This time, have each person recount the same memory of another participant. Continue until everyone has had a chance to recount someone else's memory.